The Covert Cargo Pant from Under Armour is made from a rugged polyester canvas fabric for durability. Its four-way stretch fabrication maximizes mobility in all directions for unrestricted movement, and also helps to prevent it from tearing. The waistband also stretches, providing a comfortable fit that moves with you easily. The pants are treated with a UA Storm DWR coating that repels water to keep you dry in wet conditions while still maintaining comfortable breathability and airflow. 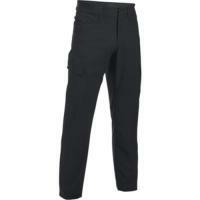 Large cargo pockets on the thighs provide plenty of storage space for your equipment, perfect for wearing on duty.